Mona Lisa movies are yet another indication that the Mona Lisa painting by Da Vinci has become a pop cultural icon. No other painting in the world has received as much notice as the Mona Lisa. No artistic topic has been debated more than the meaning of Mona Lisa's enigmatic smile. 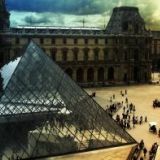 And no painting has been so visited by so many millions each year than the portrait showcased at the Louvre Museum in the heart of Pairs, France. Mona Lisa movies are not the only spin-off of the famed painting. 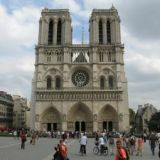 In fact, a picture of the Mona Lisa graces the cover of the best-selling novel, "The Da Vinci Code," by author Dan Brown, which set off a religious controversy. Nowadays you can also purchase Mona Lisa reprints, Mona Lisa posters, Mona Lisa line drawings and coloring pages, and even Mona Lisa hairpieces and wigs. While many Mona Lisa movies are not actually about the Mona Lisa, they often refer to her famous, mysterious smile. This is the case in the popular Julia Roberts film, Mona Lisa Smile, which tells the story of art history teacher Katherine Watson who arrives at Wellesley College in the 1950s. Watson (Roberts) introduces modern teaching methods and ideas to her students at the conservative college, inspiring them towards personal growth while balking the system at the same time. 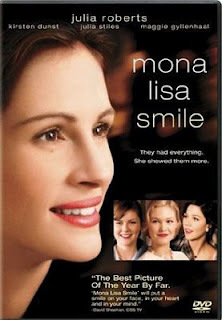 Of course, it is Julia Roberts' gorgeous smile which is compared to Mona Lisa in this chick flick, which also stars actresses Kirsten Dunst, Julia Stiles, and Maggie Gyllenhaal. The movie was shot on the actual 500-acre campus at Wellesley College, making for some picturesque outdoor scenes. Another top pick in Mona Lisa movies features the classic Nat King Cole song, "Mona Lisa," which frames the film at its start and finish. Released in 1986 by writer/director Neil Jordan, the movie, titled Mona Lisa, takes the audience into the criminal underworld, where actor Bob Hoskins' character is a petty criminal named George who struggles to keep himself afloat in the complex and deep waters of the underworld. Bob Hoskins' outstanding performance in the movie earned him both an Academy Award nomination and a Best Actor award at the prestigious Cannes Film Festival. While the question, "who is Mona Lisa? ", has been debated at length over the ages, the most widely accepted answer to date is that the woman posing for the Mona Lisa was Lisa Gherardini, wife of Francesco del Giocondo, a wealthy businessman. If you are enthralled with the Mona Lisa, search your local video store for Mona Lisa movies, or go online where you can download many of the greatest all-time flicks for free.